Please upload a picture of Spiked ball mode. This Dream Eater has two modes, high defense, and a mastery of melee. But magic is enough to mire it, and it's prone to negative status effects. Drill Sarge Does not go into Spike Mode. Roll Meister Uses Spike Mode frequently. 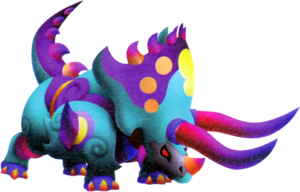 The Cera Terror is a Dream Eater that appears in Kingdom Hearts 3D: Dream Drop Distance. The Cera Terror is a stocky, armored Dream Eater with a large, wide crest on its head. It sports two long, elegantly curved horns above each of its eyes, as well as a third, much shorter horn on its nose. It has a short tail, four legs with three short claws on each foot, and a beak-like mouth. Its forelimbs are covered by two pauldrons and its hindquarters are also protected by armor. Both pieces of armor are decorated with spiral designs. The Cera Terror's body is covered with a number of spikes; there are six lining its head crest, four lining the top of its tail, one on each shoulder pauldron, and one on each of its cheeks. The Dream Eater's Japanese name combines the Japanese word for "horn" (角, tsuno?) and "Triceratops". Its English name combines the Greek word for "horn", κέρας (kéras), with "terror", referring to its imposing form. Both of these names reference the Cera Terror's resemblance to the Triceratops. The Spirit version of the Cera Terror has the Spirit Dream Eater emblem on its forehead, between its two large horns. The lower half of its head crest is red, while the top half is predominantly yellow and decorated by cyan circles. The tip of the crest is spring green and it has a large, yellow, circular pattern in the center of the crest. Its face is tan and the tip of its snout is red. The horns on its head are white at their bases but fade to violet toward their tips. They are anchored to the Cera Terror's forehead by metallic blue and gold bases. The horn on the Dream Eater's nose is cyan with a dark blue tip. Its body armor is predominantly red and lime green. Its neck and midsection are dark blue. It has red legs, cyan knees, tan feet, and purple claws. The two outermost spikes on the Dream Eater's head crest and the spike at the base of its tail are cyan with dark blue tips. The remaining spikes on its body are tan with purple tips. Its chest is purple and spring green and its eyes are yellow-orange. Its eyes are heavily outlined in black and they have vertical slits for pupils. The Nightmare version of the Cera Terror has the Nightmare Dream Eater emblem between its two longest horns, on its forehead. The lower half of its head crest is cyan, while the top half is purple and decorated with orange circles. The crest is also decorated by the same yellow symbol as the Spirit Cera Terror. Its body armor is primarily cyan and purple. Its two long horns are magenta at their bases and fade to violet toward their tips. They are anchored to its head by violet bases. The horn on its nose is orange with a violet tip. It has cyan legs, magenta knees, violet feet, and yellow claws. 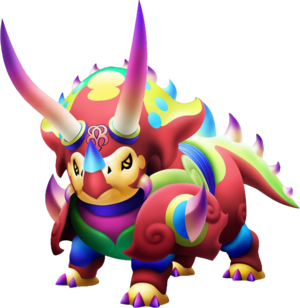 The two outermost spikes on its head crest and the spike at the base of its tail have orange bases and violet tips, while the rest of the spikes on the Dream Eater's body are magenta with violet tips. The Cera Terror's midsection is yellow, its face is metallic grey, and its eyes are red. Like its Spirit counterpart, the Nightmare Cera Terror's eyes are heavily lined in black. ↑ 1.0 1.1 1.2 Becomes available when in Demolisher disposition. ↑ 2.0 2.1 Becomes available when in Drill Sarge disposition. Riku obtains the Cera Terror Recipe after defeating the herd of Cera Terror in the Back Streets. The Cera Terror can be created through six different recipes. The fourth recipe is a rank C recipe that has a 40% chance of transforming from Drill Sye. The fifth recipe is a rank C recipe that has a 70% chance of success. The sixth recipe is a rank B recipe. This page was last edited on 31 March 2019, at 10:54.